Catholics who participate in the World Meeting of Families in Dublin in August or pray with their families during the Aug. 21-26 event can receive a plenary indulgence, the Vatican announced. An indulgence is a remission of the temporal punishment a person is due for sins that have been forgiven. “So that the faithful prepare spiritually to participate in the event in the best way, His Holiness Pope Francis willingly concedes the gift of indulgences,” said the decree released May 22 by the Vatican Dicastery for Laity, the Family and Life. The conditions necessary for receiving a plenary indulgence include having recently gone to confession, receiving the Eucharist and offering prayers for the intentions of the pope. 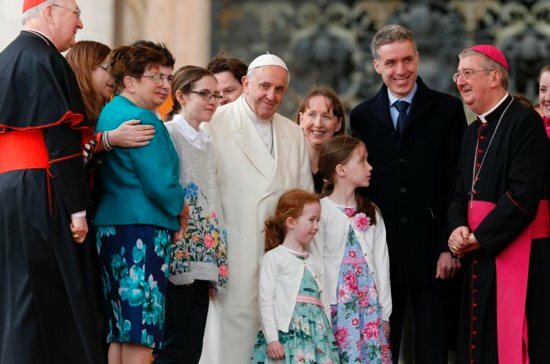 Those who cannot travel to Dublin for the event in August still can receive the indulgence, the decree said, “if, spiritually united with the faithful present in Dublin, they recite as a family the Our Father, the creed and other devout prayers” for the good of families. The decree, signed by Cardinal Mauro Piacenza, head of the Vatican office that deals with indulgences, said a partial indulgence is also available to all Catholics who, no matter where they are, offer prayers with the pope for families.